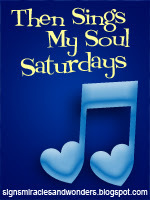 I look forward to Then Sings My Soul Saturday. I join Amy of Signs, Miracles and Wonders. I find that I'm on the lookout each week for a song that I love. And then I get to visit other participating blogs to see what songs they posted so I can sing along and ...praise God. This week I chose Sandi Patty's version of We Shall Behold Him. She was one of my favorite Christian singers when I first got serious about my walk with the Lord. A friend at work was so proud that she came from the same city as Sandi Patti; Anderson, Indiana. So, Tonya gave me a cassette tape of her music. I used to play it over and over on my way to work. Sandi Patty has been blessed with such a beautiful voice. I long for the day when I see Him face to face. Can you wait for that day, my friend...when we shall behold Him? Can you see the expressions of the people in the audience? Precious! Thank you for sharing this today! Sandi Patti has a beautiful voice. One of my favorites is the duet she does with Larnell Harris, "I've Just Seen Jesus". It gives me goose bumps every time I hear it. It makes me all the more homesick for heaven. This song moves me. I love Sandi Patty's voice. She uses her gift to worship God and pull us in along with her. I use to listen to her also. She has such an amazing voice! I too love this song and just about anything that Sandi Patti sings. As a young christian, wife and mom I would play her music continually-just helped to get through those daily challenges. Beautiful song very sweet voice! Incredible voice and talent. Thank you so much! What a voice. Now that is a perfect example of the Master's gift being used as he intended. It was such a blessing to hear Sandi Patty sing this weekend at Women of Faith.